Today, I was left speechless. Today, I received a spiritual stomach punch of conviction of unworthiness while at the same time understanding just how much God loves me and much grace He has given to me. I text a few friends today and I told them this – Today may have been the most spiritual day of my entire life. I’ll have to tell you about it. I felt the power of God in a way that I am not sure I’ve felt in a long, long time. I felt convicted, condemned, loved, and forgiven all at once. Today, I was left speechless by Jesus Christ. Let me tell you what we did. I always review the day in these, and they can get a little wordy! But, I really hope you will stick with this long enough to read about what the Lord laid on my heart today. First, we started our day at Bethpage. This is the traditional site of the starting of the Palm Sunday processional. This was the first part of what was an emotional day for me. We heard the story of how Jesus was worshiped, and then we sang. And, as I sang hallelujah to my Lord, while sitting there, I was overcome at the love that Jesus had for us, as He was coming to Jerusalem. I was overcome at His worth, as His glory, at just, well Him. He is Lord. From there we went to the Church of Pater Noster. And this is also when the rain really, really, really started. Today was cold and wet. It never really felt above freezing and we were wet to our bones. But it was worth it! Here, we went into the cave that this the traditional spot of where the Lord’s Prayer was given. 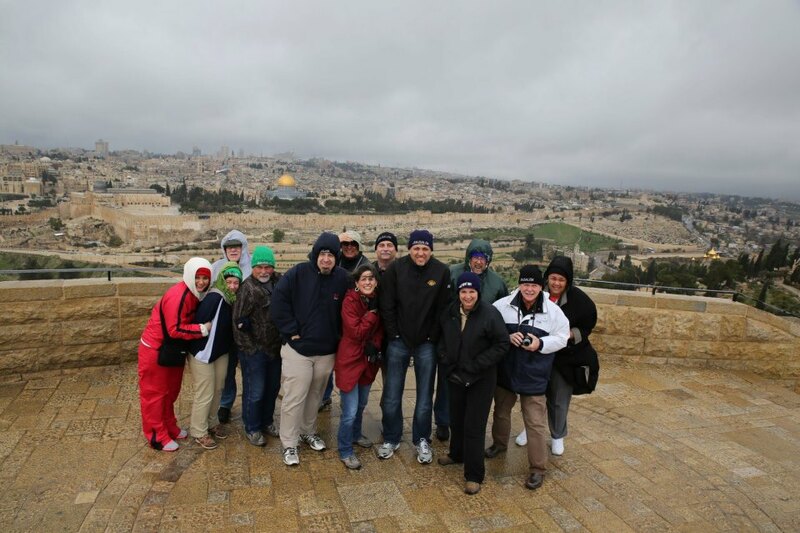 We made a quick stop to get our picture taken in front of the Dome of the Rock. That’s the traditional skyline picture you see of Jerusalem. You see ours to your left, as we tried our very best not to be blown off the Mt. of Olives. From there we went to the Garden and the Church of all Nations. The garden was the place where Jesus prayed until sweat drops of blood came. It was the place of His agony, but also where He said, not my will but thine. There is a church located beside the Garden, and it’s called the Church of all Nations. 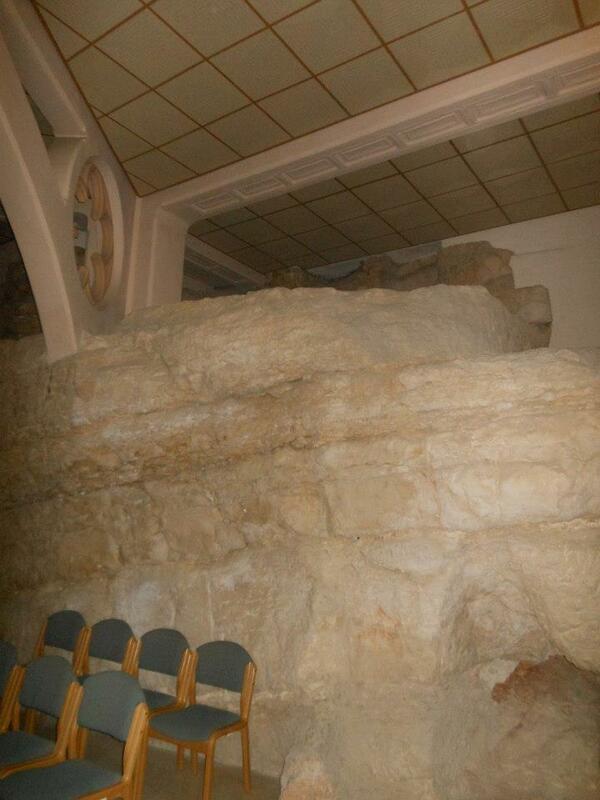 It’s built around the rock that is the traditional rock on which Jesus prayed. It is a beautiful church, but different. While the other churches are light and bring, this one is dark. Ominous. You know that you are in a sacred, holy place. 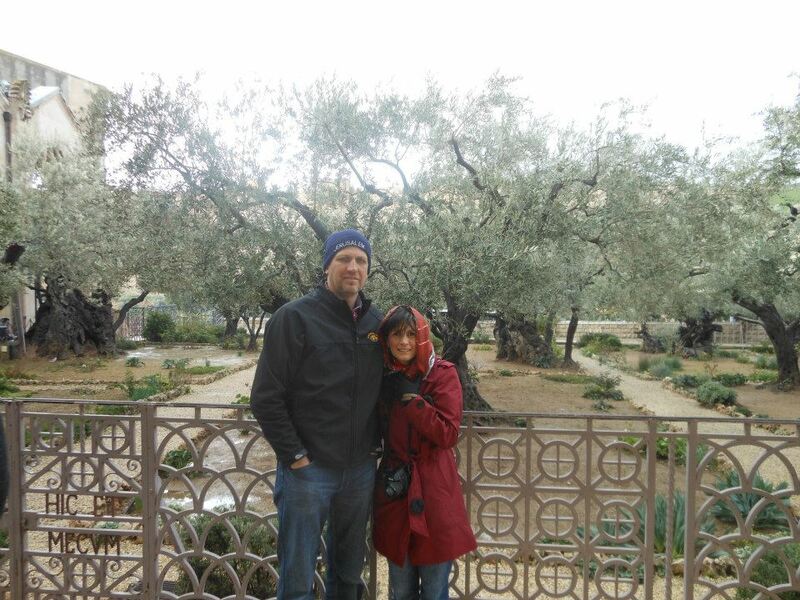 Later in the day, we went to the traditional site of the Upper Room and Abbey of the Dormition. What is so cool about this two-fold. First, this upper room site wasn’t the actual Upper Room, but it was very, very close by. This is not the “place” of the Upper Room but it is the site. Second, underneath it is a synagogue that was built, and this synagogue, instead of facing the Temple, it faces the Church of the Holy Sepulcher This has led many scholars to believe that this place not just the site of the Upper Room. But is in fact the site of the Mother Church! But, for me, the thing that hit me, that convicted me, that left me in a puddle of my own tears was the Church of St Peter in Gallicantu. 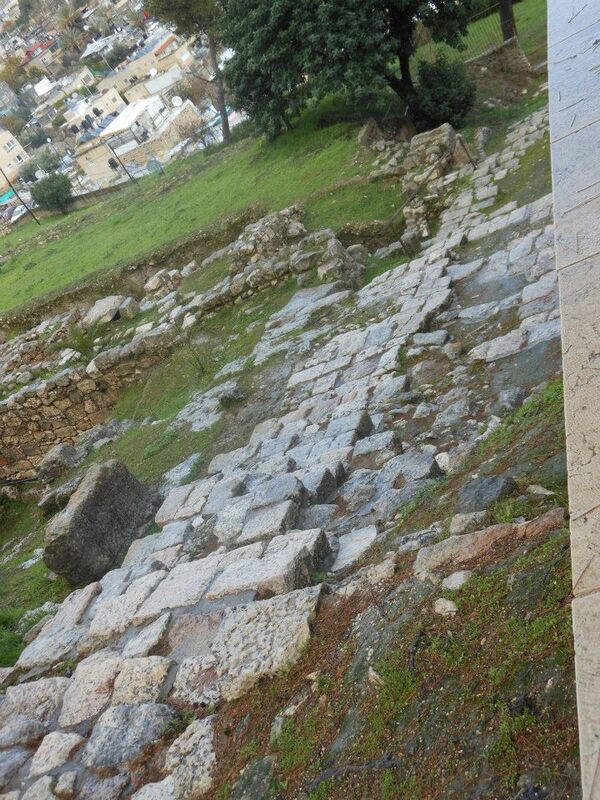 This is the site, we believe the authentic, actual site of Ananias, the high priest’s home. 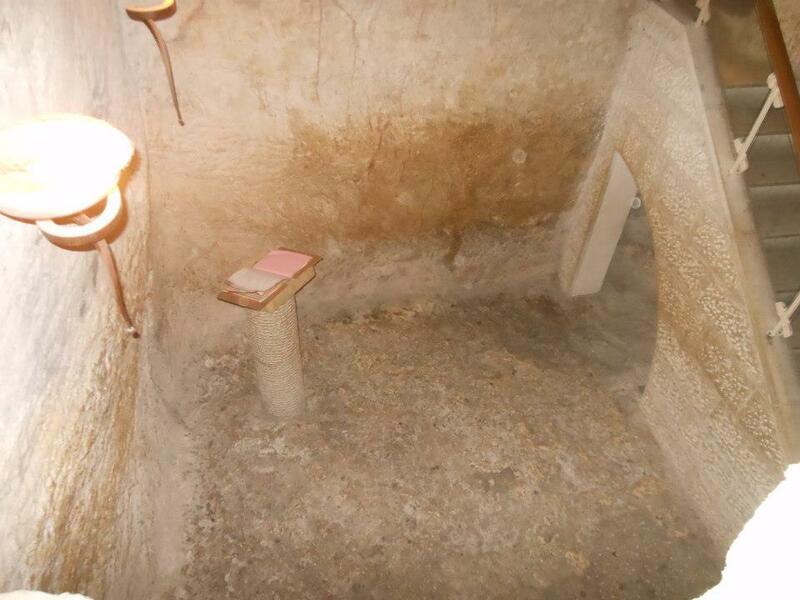 This is so, so important, because this is where Jesus would have been taken for the first part of His trial. You can see the road He would have been brought upon there on your left. His beatings and His mocking would have started here. And this is also the place where Peter would have denied Him three times. Here is the thing. We are fairly certain Jesus judgement was pronounced here. So, look to your right. That is the seat of Judgement, where the high priest would have sat to pronounce judgement on the prisoner. It’s on that rock, the very top one right there, that Ananias would have sat. Jesus would have been beneath him on the rocks, on his knees, bound. 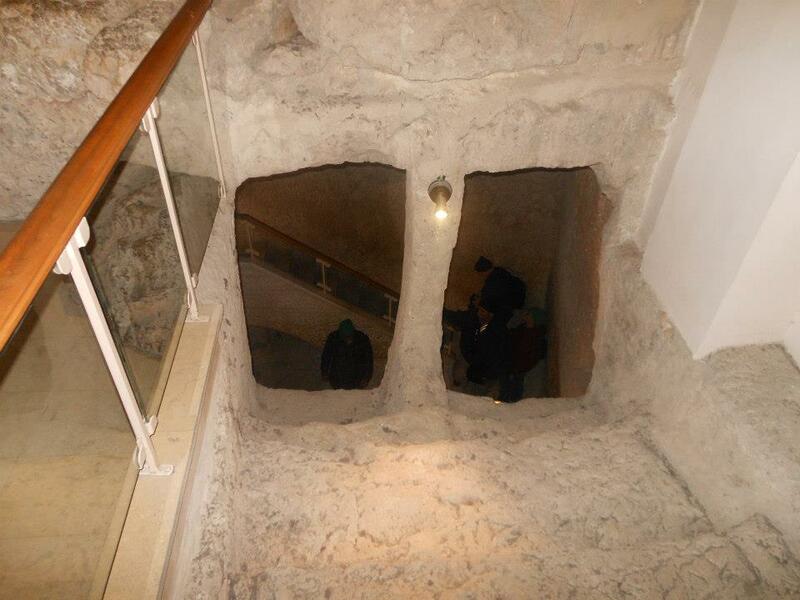 Ok, here below you, that is the hole that Jesus would have been thrown into to be held in “prison.” This prison would have literally been a dark cave. He would have been picked up, while bound, and thrown through those holes, into that cave below. He would have been helpless. He would have been unable to break His fall. Many prisoners would suffer broken legs at that point. This happened. For real. In this place. And here, right here below that picture, this is the cave that Jesus was held in. And this is what undid me. This what left me speechless. As we were sitting the chapel that sits directly above the cave, the chapel that the judgement seat is in, it hit me. Jesus was judged there. He was judge for me there. He went through all of this for me there. And here is the thing that I was so convicted, so in awe, so humbled by. I am a high priest. I am Ananias. Not in terms of position. But in terms of this. The hight priests did everything for show. Their religion was an outward religion. Their hearts where not in it. The had the form of religion, bu not the heart of religion. They were just going through the motions. That’s me. I’m a preacher. As I say, I do the whole religion thing for a living. One of my mentors told me this, Sunday’s always coming. There things that I have to do. Whether I want to or not. And sometimes, my heart is isn’t in it. I do them because I must. I do them because it’s what I do. I do it because it’s my job. And sometimes, that make me think I’m a good person. It makes me think that am really good. Jesus told me, plain as day, I am not. I am not as good as I think I am. He despises it when I think that way. He doesn’t want that. He doesn’t want show religion. He doesn’t want those actions. That’s the high priest, doing things out of obligation. Or doing thing to make me look good or holy. He doesn’t want that. He wants me. He wants my heart. He wants all of me, starring with the inside. He was judged. And died. Because I’m a high priest. Because we are high priests. Because we have religion. But do we have a heart change? It’s not that I’m a “good person.” I’m not a good person. I am a lowly sinner. My good works don’t matter. It’s my heart. I became so convicted today that too often my life can become about my duty. Doing what I supposed to do. Instead about my heart. My confession of sin. My awareness of Grace. My need for Jesus. These are not just empty words. I am nothing without Jesus. Nothing. May I never become so arrogant to think that I am. Today, I was left speechless by what my God did for me. And the only response I can have not the form of religion, or of ministry. But of confession of my sin, and receiving of grace.